The Corporate Accessibility Technology Office (CATO) inside AT&T, ensures that AT&T’s products and services are accessible to all of their customers. Through programs like CATO, AT&T develops solutions that meet the needs of their customers and communities. We interviewed Dr. Aaron Bangor, the Lead Principal Technical Architect of CATO (Corporate Accessibility Technology Office). Aaron tells us CATO started about five years ago. CATO is staffed with primarily with two types of folks. One was folks with a strong process and compliance background. The other type of technical expertise. As an example of what CATO does, suppose you’re building an IVR, which is an interactive voice response system. When you call customer care and it’s, press one for this, or two for that, you must make sure those systems are usable by somebody with limited mobility or cognitive or hearing disabilities. The different types of technologies that AT&T has to work on are quite great, including websites, hardware, emails, PDF’s, text messages, etc. Including websites, that first year, CATO looked at around 10,000 projects. This link and others related to our accessibility solutions can be found at att.com/accessibility. Real‐time text (RTT) communication is a conversation of text and voice for persons with disabilities to make every day and emergency calls. You start a text conversation with a voice call but it is different from instant messaging and SMS. Both persons see each text character appear on their device as they are sent. 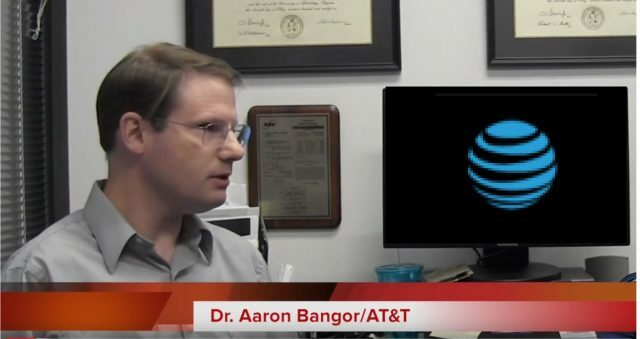 Dr. Aaron Bangor is the Lead Accessible Technology Architect in AT&T’s Corporate Accessibility Technology Office (CATO), where he conducts research and promotes solutions for making technology usable by all. Previously, he worked in the Human Factors Engineering Group of AT&T Labs. He earned a Ph.D. in Human Factors Engineering from Virginia Tech, currently holds 30 patents and serves as the Chair of the Texas Governor’s Committee on People with Disabilities. He is active in the area of standards, including national and international standards for accessibility.